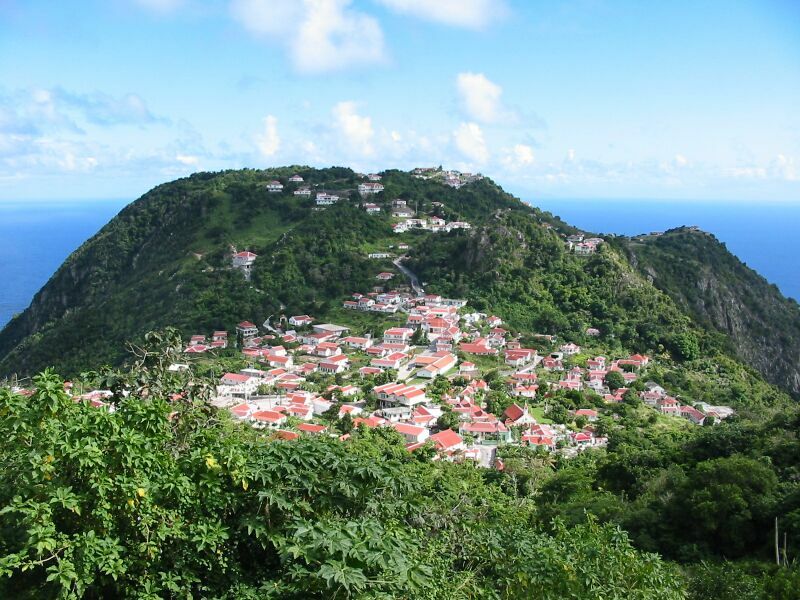 Saba is an awesome sight jutting 3000 feet above sea level with craggy rocks piercing deep blue waters all around. 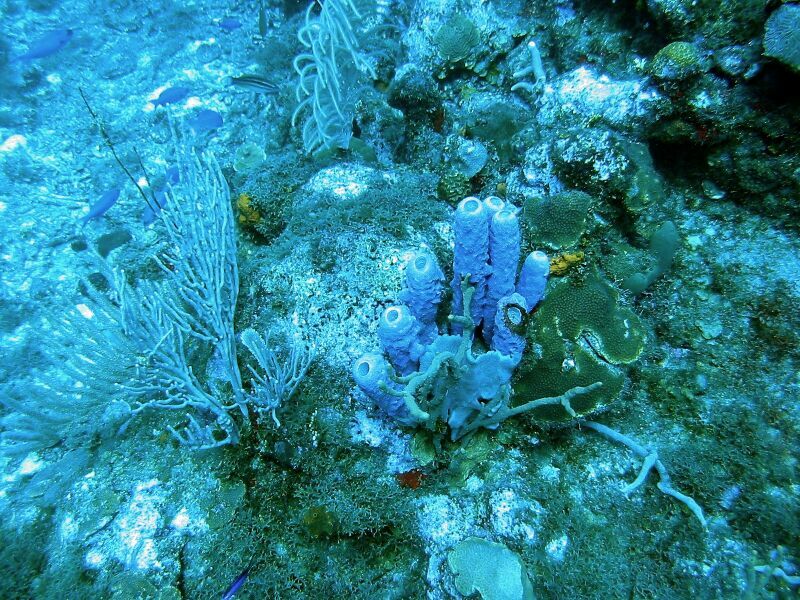 It is known as the diving capital of the Caribbean. It also has amazing architectural feats in the form of amazing roads which tie the close-knit community of beautiful houses and buildings which cling to high mountain ridges and cliffs. It seems that every building has incredible cliff-edge views of the entire Caribbean. At sea level, there is mostly just rock cliffs and crashing waves. But, high above the sea, you can see lucious green vegetation and at the higher altitudes there is actually rain forest vegetation and birds in abundance. We spent only a long weekend at the island, but there is much to tell and show. We did two dives and some snorkeling, toured the island, and also helped to rescue a boat which slipped its mooring (with no one on board) and no anchor light - and we found it at NIGHT! It was like searching for a needle in a haystack, but PatiCat helped guide us to the lost little boat. 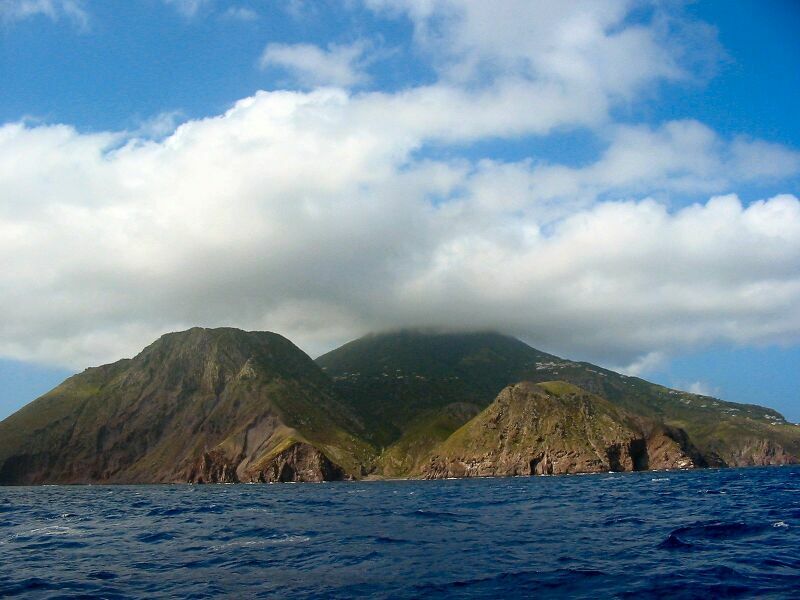 Saba is called the "Unspoiled Queen of the Caribbean". It is "unspoiled" in the sense that they have retained their culture in large part due to the unique nature of the island. We knew it would be an interesting visit, but it actually is the most interesting of the islands we have visited yet. But first, let's start at the beginning of this amazing visit. 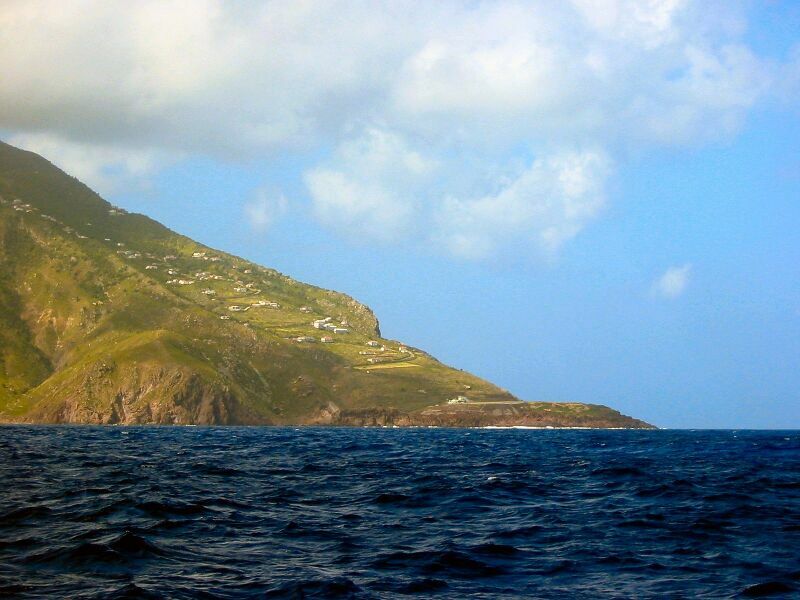 Wilson (skipper of Hotel California) and Frank went ashore early on January 10th to clear out of St. Bart's customs. 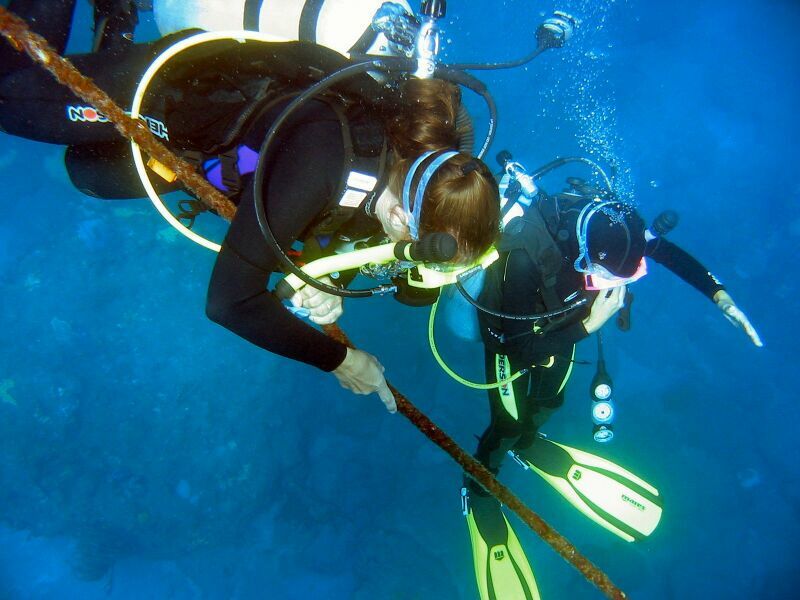 We went back and immediately pulled our hooks (anchors) and started sailing for Saba. We had perfect conditions with a port beam reach, seas off the port beam, and a single tack all the way to the port of entry at Saba. We averaged 8.5 knots the whole way. 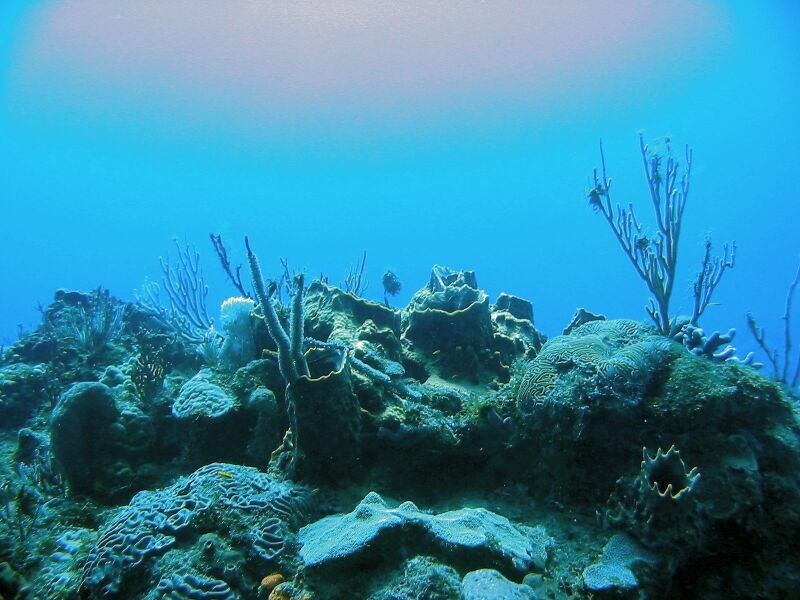 You don't often have better conditions than this in the Caribbean! 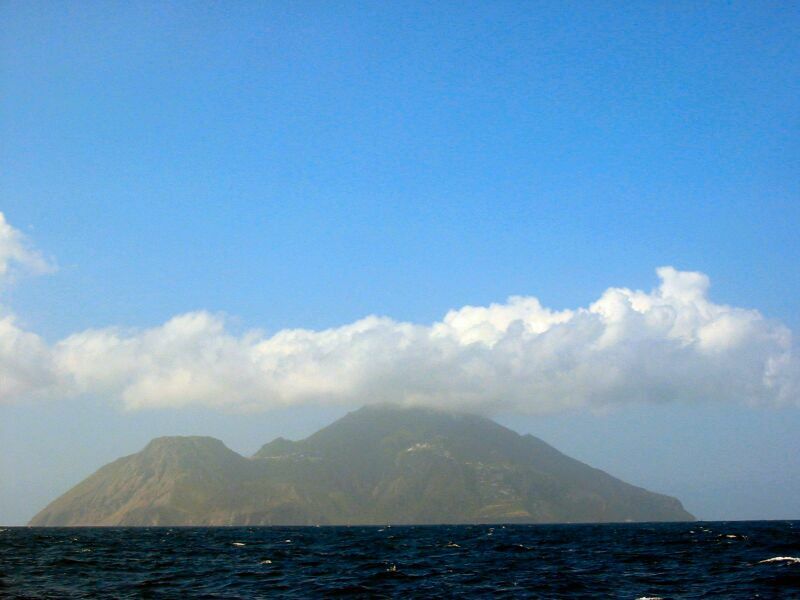 Well, one drawback was the hazy conditions, we couldn't see Saba until we were half way across - only 15 miles to go. As we approached the island, the uniqueness of the island became more and more apparent. We first noticed the houses built up the eastern side of the island. As we got closer, we could see the famous little airport cut on the top of a rock on the eastern shore. 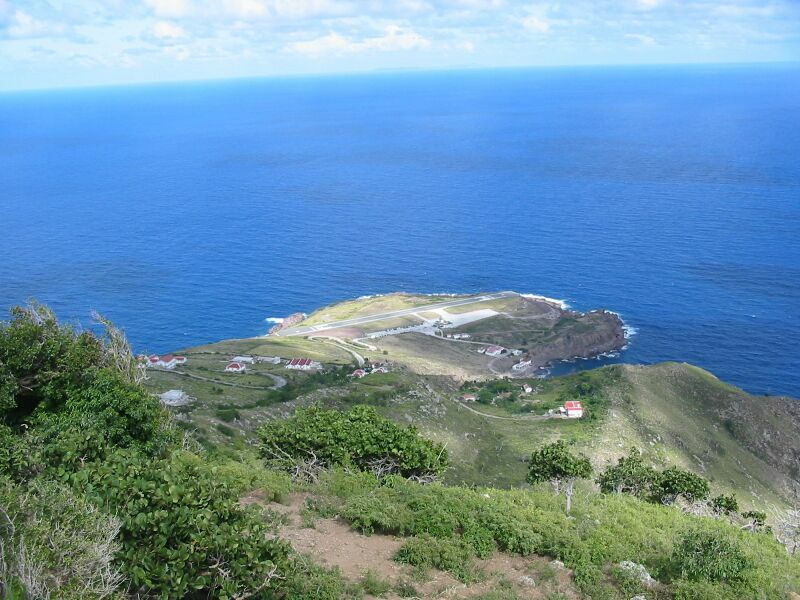 It is famous for being the shortest runway in the Caribbean - only about 1300 feet. They say it is like landing on an aircraft carrier, and we could easily see why. The entire island is just sheer cliff at the shore. In fact, for decades the only way to get from the shore up to where the towns and houses were located was from a single sheer staircase cut 1000 feet down a cliff to the shore. This is one reason the island was never taken over by attackers in the 17th through 19th centuries since it was easy to drop boulders on anyone trying to approach from the shore. We arrived at Fort Bay around lunch time. This is the "new" way to get up the island. 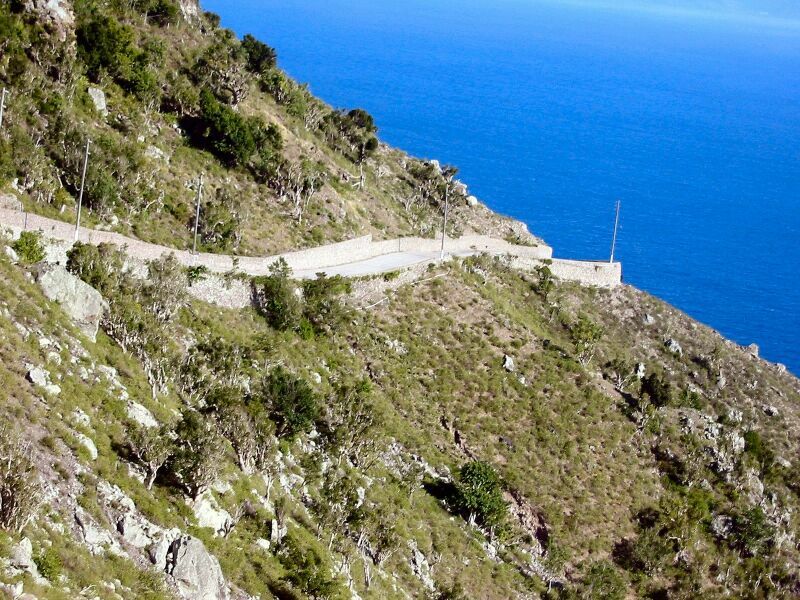 They actually built a very steep road with a few hairpin turns in it up to Bottom, the first and lowest level town on the island. Bottom is also the "Top" in that it is the capital of this small country. Only 1800 people live on the island. There were no moorings available for visiting yachts, and the waters were deep, so we went around to the west side to moor. We waited a while for the customs people to eat lunch and then went back to Fort Bay by dinghy and cleared in. We also made arrangements for a two-dive diving trip for the next day. We moved to better mooring locations further up the western side. There was some ground swell, but not too bad for catamarans. We rested, did some snorkelling, had some dinner and got some sleep. The 11th was an amazing day for the crew of PatiCat. We, along with Wilson from Hotel California went on the dive trip, while the rest of the folks from HC took a taxi to see the top of the island. 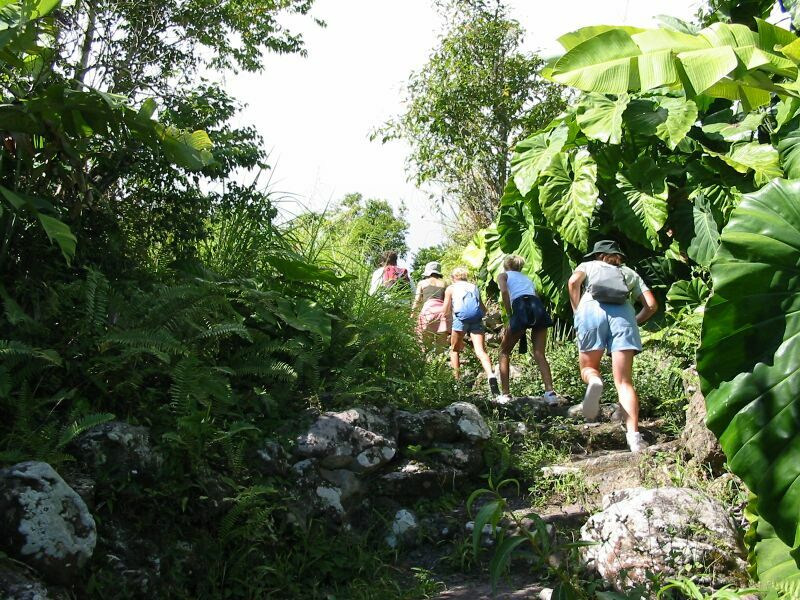 They actually did the hike up 1100 steps to the top of the Saba peak. While waiting for the dive to start, Frank and Wilson noticed a small mono-hull - about 24 feet - with racing colors and sails at a high angle of heel (leaning over) sailing into the harbour. We noticed the boat didn't have an engine. It appeared first to be sailing solo (one person on board), however as they approached another person started assisting. Wilson and Frank remarked that they didn't envy them trying to pull into Fort Bay with no motor. 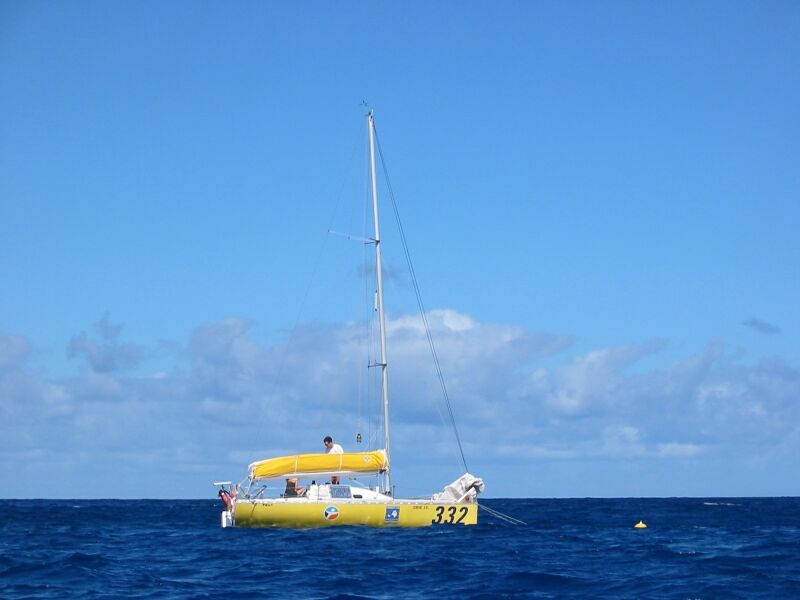 They tacked several times and eventually managed to sail up to a mooring ball and pick it up. We thought it was interesting, but didn't think anything more about it. As soon as the gear was washed off, Frank and Catherine rushed the gear back to the boat by dinghy. On the way back, Frank noticed the little racing boat was tied to a big metal mooring used by the ships. We knew Fort Bay didn't allow visiting boats to use the mooring balls. 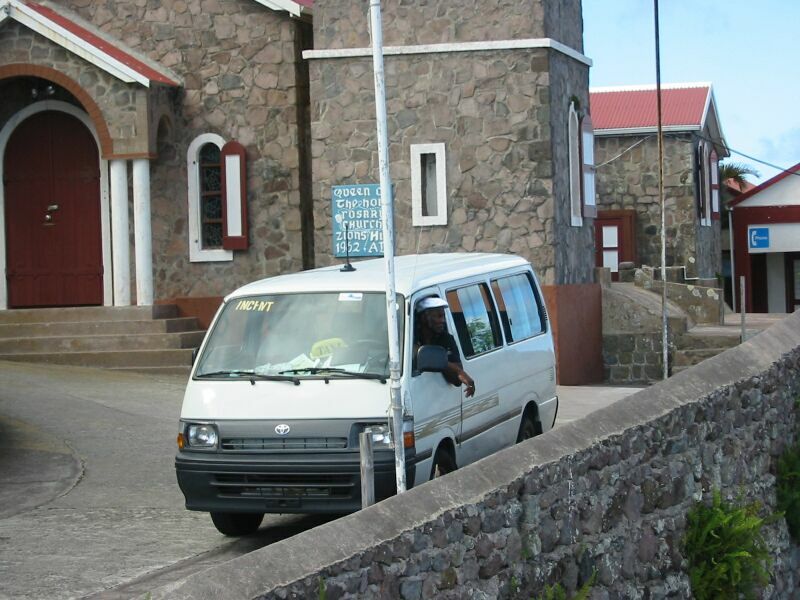 Frank and Catherine got back as quickly as possible and took a taxi up to Windwardside. This was our first look at the top of the island, and it was simply amazing. The contrast from the craggy vegetationless bottom, to the green unspoiled top with houses and villages located in the only flat areas, was simply amazing. The construction of the roads were amazing. Especially when we found out from the taxi driver - whose name was Vincent - was built by the island people using no large machinery. They used picks, axes, wheelbarrows, donkeys, and dynamite to build the whole thing - it took over 20 years. Simply amazing! Windwardside is on the eastern side at a much higher elevation than Bottom. 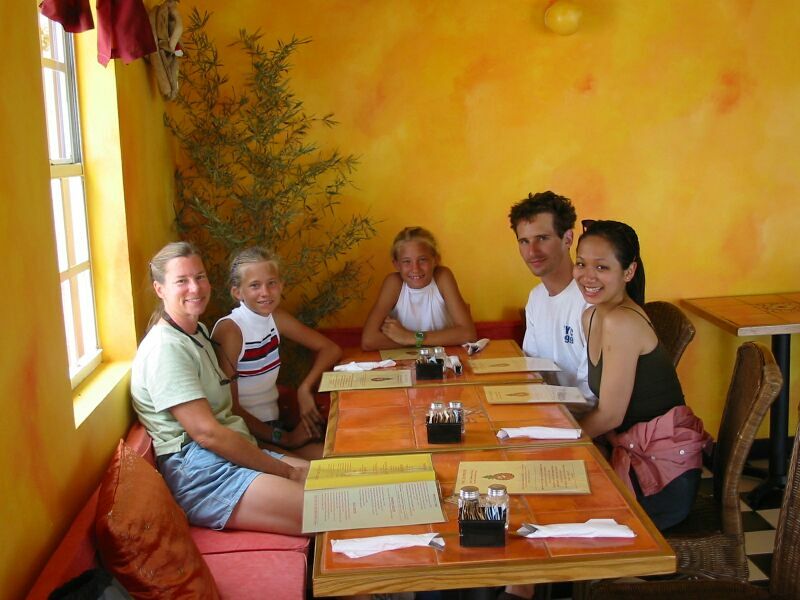 We met up with the family of Hotel California, but they were ready to go back to their boat after their long hike. So, they left, and we stayed to explore Windwardside. We found the nice grocery store and bought some ice cream and sodas. We then walked through some of the small shops. We found a restaurant for dinner, but they wouldn't open until 6:30 PM. So, we did some more walking around town. The girls played with a young German Sheppard in front of a Dive Shop for a long while, and eventually we went up to the restaurant. Here's some pictures: first the "Road That Couldn't Be Built" (Dutch engineers told the people of Saba it couldn't be done, but that didn't stop the people of Saba), a picture of the airport from above, Vincent the taxi driver, and Windwardside. We had a lovely dinner, but we noticed the waitress was a bit distressed. She left the restaurant for a few minutes twice, and we found out she had a young sister who was very sick. The girl is only 4 years old, and has a sick pancreas. The waitress told us they were going to have to take her to the home country (Holland is their home country) for the doctors to treat her. We told her we would keep her sister in our prayers, and left after a very nice dinner. The taxi took forever to show up - about 45 minutes, but it finally picked us up around 8:20 PM. We headed down to Fort Bay so we could take our dinghy back to the boat. NOTE: the rescue fully occupied our minds, and it was dark anyway, so of course there are no pictures. Hopefully our words will illustrate the drama of this amazing event. When we got to Fort Bay, Frank went down to the dinghy and noticed it was quite dirty - dust from the nearby construction. So, Frank took out a chammy cloth and started cleaning. While he was doing this, a young man (early 20s) came over and started telling us he had a problem. He was the skipper of the little racing boat we had seen earlier. Apparently their boat broke loose from its mooring while he and his crew member were having dinner. They saw the boat at 6:15 PM, and it broke loose between then and 8:00 PM when they got down to Fort Bay. They asked if we had a radar on our boat, and if we could help them look for it. Frank told the skipper, whose name was Alex, that we do have a radar, and we would take him out immediately to look. Alex said the boat has a radar reflector, so even though the boat was small we might be able to find it. So, we all jumped on to the dinghy and drove around to PatiCat. On the way, we scanned the horizons - and the cliffs - for any sign of Alex's boat, which is called "Tomacho". We noticed the winds were curving around the island, so it wasn't immediately clear which direction the boat might have gone. Fortunately there was a quarter moon and few clouds so the moon was providing good light. We got to PatiCat and started up the motors and dropped off the mooring. Frank called Hotel California and aprised them of the situation and asked them to look on their radar. The only thing they noticed was an object 4-5 nm to the south. We didn't form any opinion on our radar scans until we got further away from the tall island. We first headed out west since the winds wrapped around the island to the west and then to the south along the western side. As we got further out we saw the radar object appear to the south, and it was intermittent. However, we weren't too sure that could be it because the winds were still coming from E to SE. We headed SW until we were off the SW corner of the island about 3-4 nm out. We were hailed by Saba's Port Authority. They were keeping Alex's female crew member company, whose name is Isha (not sure how it is spelled - pronounced "Eye-Sha"), at their office. They were asking what our plans were. We kept them posted as we went along. It was about 9:45 PM at this point and we had a strong radar object about 10 nm out, and saw the lights of a cargo ship. The winds were still SE. The intermitten object to the south was now 4.5 nm south of us and moving slowly south apparently. Alex and Frank decided it was possible his light little craft which has tall sides, could be "sailing" south with the SW winds. So, we did the only prudent thing, we headed toward the radar object to the south. One encouraging thing was that the radar object had no light. By the way, the winds were about 15-20 knots and the seas were about 4-6 feet at this point. 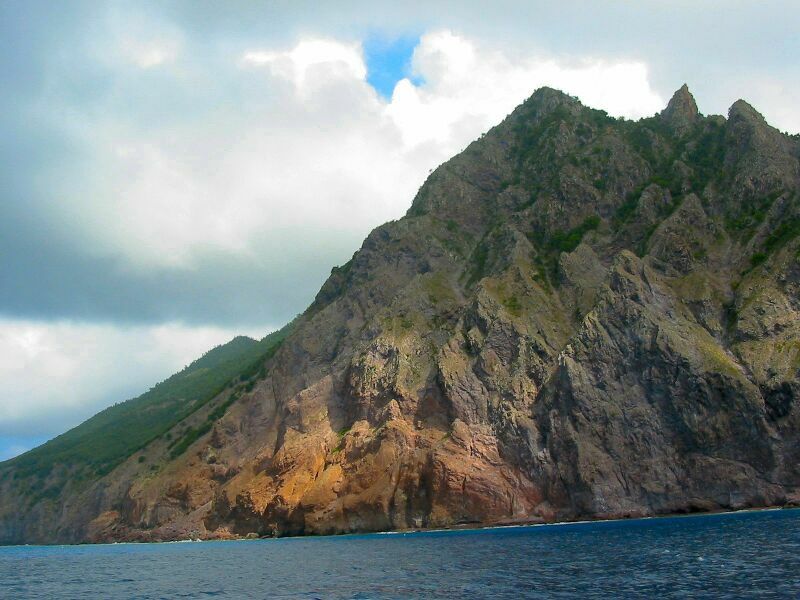 Once we got about two or three miles south of Saba, we went over the Saba Bank - a shallow area surprising because near Saba seas are 3000 feet deep. The Bank is about 50 feet deep. We first noticed we were there because Karen spotted some fish traps (they mark the traps with ropes tied to floating rubber or plastic balls). 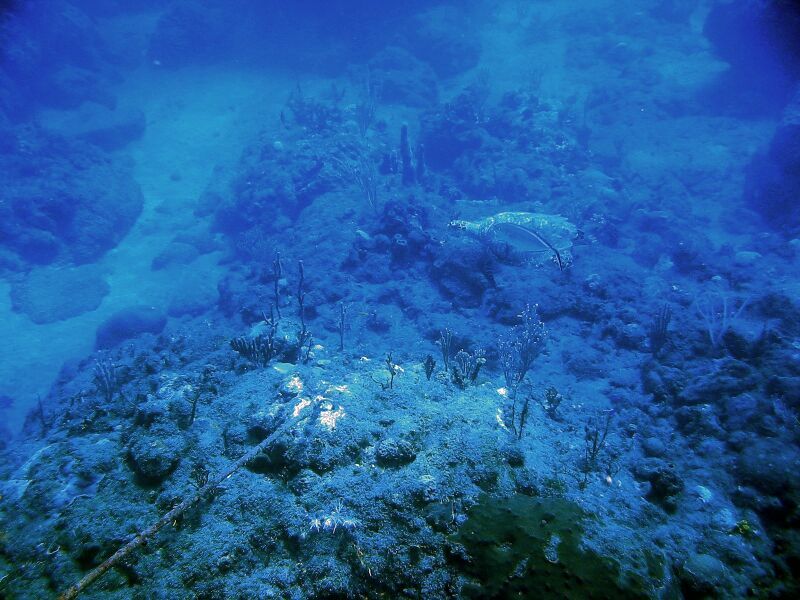 We always try not to go over these traps as the ropes can get caught in our propellors. The shallow waters made the seas even more turbulent and the waves were now 5-7 feet. So, now we were dealing with a bouncy boat, and were not only looking for Tomacho, but also dodging hard-to-see fish traps. About 45 minutes later (PatiCat averages about 7 or 8 knots in these conditions under motor power), we got closer to the radar object. We scanned with binoculars and by naked eye. We got within 1/4 of a mile, and suddenly both Frank and Alex spotted it! There was Tomacho! Hurray! 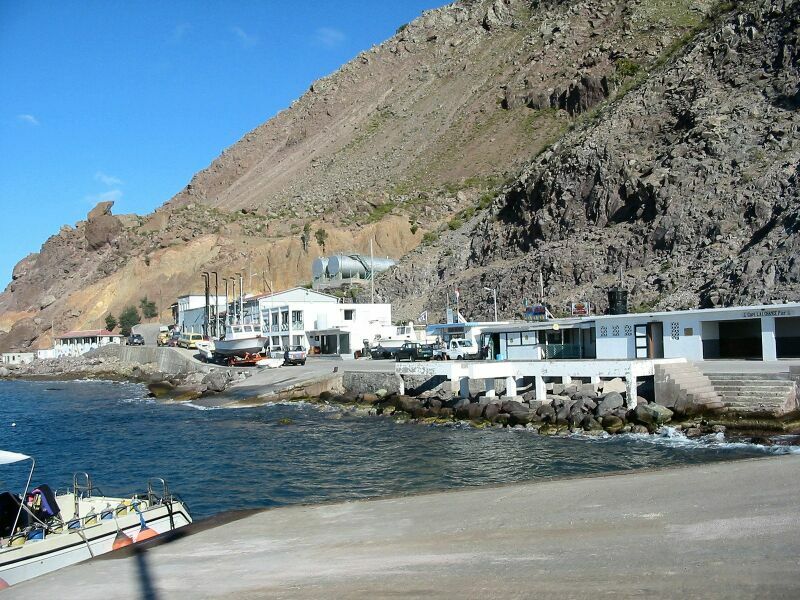 We told Saba Port Authority by radio that we had found the boat and Alex would be sailing it back. Next we needed to get Alex out to Tomacho. This was when Alex realized Isha had the key to the interior of Tomacho. So, he wouldn't be able to turn on his instruments or his nav lights. We told him we would sail back with him and he had a flashlight to help us see him. Althouhg the moon was still plenty bright. We had left the dinghy pulling behind, but the seas were now about 5-7 feet and quite choppy as we were in the 50' shallows. We had to jump onto the bouncing dinghy and motor over. This was not a dry experience. We got over to Tomacho and Alex managed to climb nimbly over the aft corner and pulled himself up on the lifeline. On the way back, Frank hit an unseen wave and the dinghy flew vertical about 3 feet clear of the water with the engine whirring in the air. Karen heard the engine, but thankfully didn't see it. Fortunately, the dinghy managed to land back right side up! Just tying the boat up and getting back onto PatiCat was a wet and dangerous experience. Karen nearly fell into the water while trying to tie up the dinghy when she tried to hold the rope as a wave pushed the dinghy away. Both of the boats raised sail and we began to make our way back. It was now about 11:20 PM. We had a nice sail back with PatiCat reefed back so we didn't outpace the smaller boat. 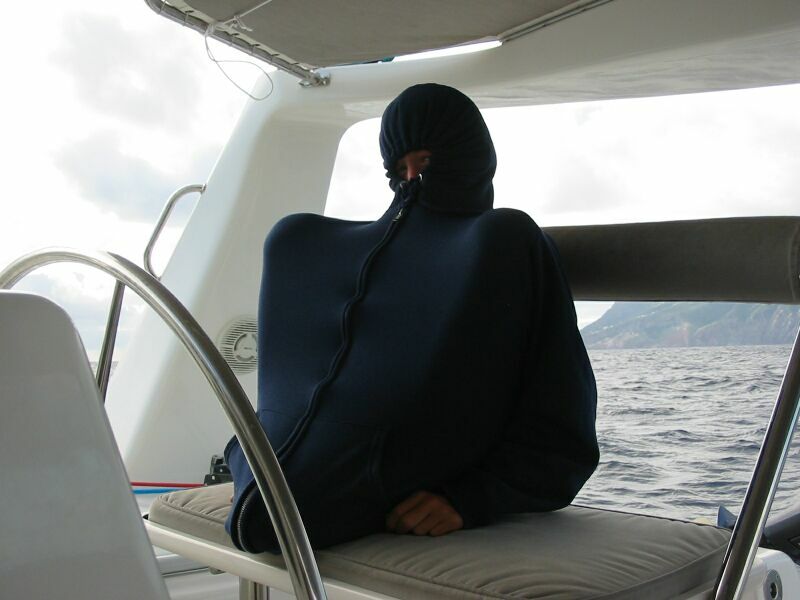 Tomacho is only capable of about 5 knots upwind. We wished we had left a radio with Alex so we could talk to him. We signaled to each other by flashlight. Once we got closer to Fort Bay, we took PatiCat ahead. Frank got on the dinghy again and went out to Tomacho as Alex approached. Frank suggested to Alex that we pick up Isha and Alex should sail around to the west side and moor. It would be too dangerous to bring Tomacho into the port at night. So, Frank went ashore and picked up Isha. It turns out that two port authority gentlemen and Vincent the taxi driver all stayed with Isha through the drama of the rescue. They brought her out and helped her get in the dinghy. We thanked them profusely for their assistance. Frank got the keys from Isha and we dropped them off to Alex. We also gave him a radio this time. Isha did not seem very experienced at sea, so Frank didn't think it would be a good idea to let her try and get up on Tomacho in those seas. Isha very gladly climbed aboard PatiCat and we sailed around the island. Once to the mooring area we moored PatiCat. Then Frank got into the dinghy and found another mooring ball for Tomacho (remember, this was at night, so it wasn't exactly easy to find mooring balls). Also, at this point it was 1:00 AM, and the moon was setting. By 1:30 AM, Karen and Frank were finally ready for bed. It was a LONNNNNNG day! Background on "Tomacho" and its crew: Here is some information we learned about Alex, Isha and Tomacho. Tomacho is a french class boat of some sort, about 8 meters/25 feet in length. Alex is a recent EE Masters graduate of MIT who decided to take time off after graduating and sail the Caribbean and beyond. He bought Tomacho in Guadeloupe and had sailed her to St. Thomas before picking up Isha there. He had lots of sailboat racing experience before getting Tomacho, but little blue-water/offshore experience. Tomacho has a radar reflector (or we would never have found her), and some basic instruments like compass, wind guage, depth meter, etc. 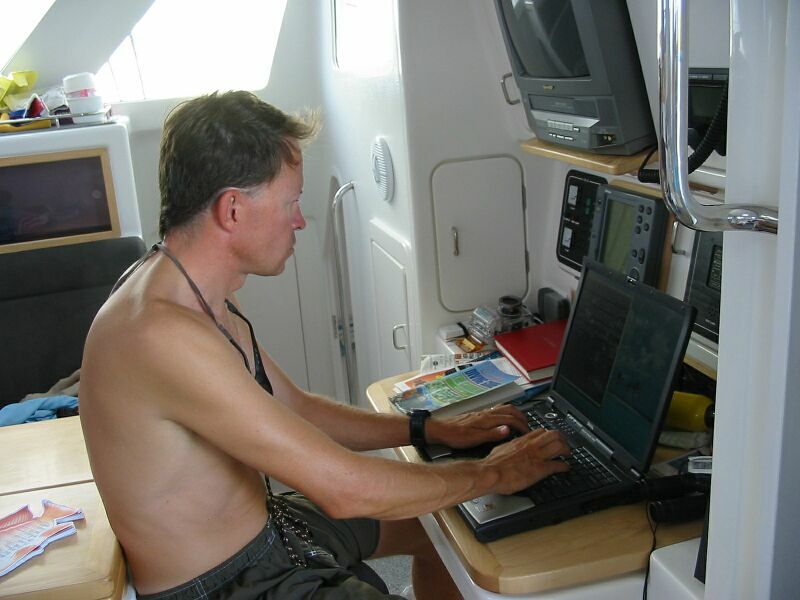 Alex had a GPS, but it went bad on his passage from St. Thomas to Saba. Here's the interesting part. Isha, Alex's companion, joined Alex in St. Thomas. 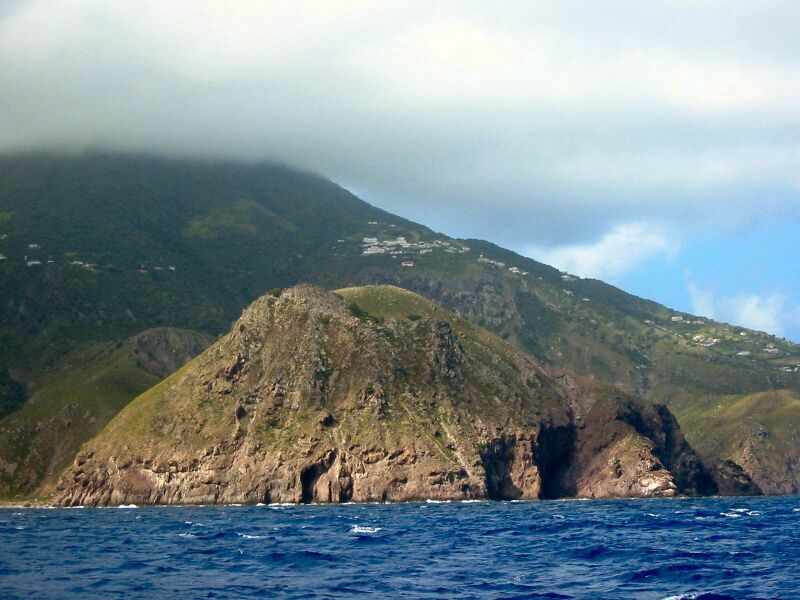 The next day after she arrived, he suggested they go to Saba - about 100 nm away across the Anegada passage. Guess what? 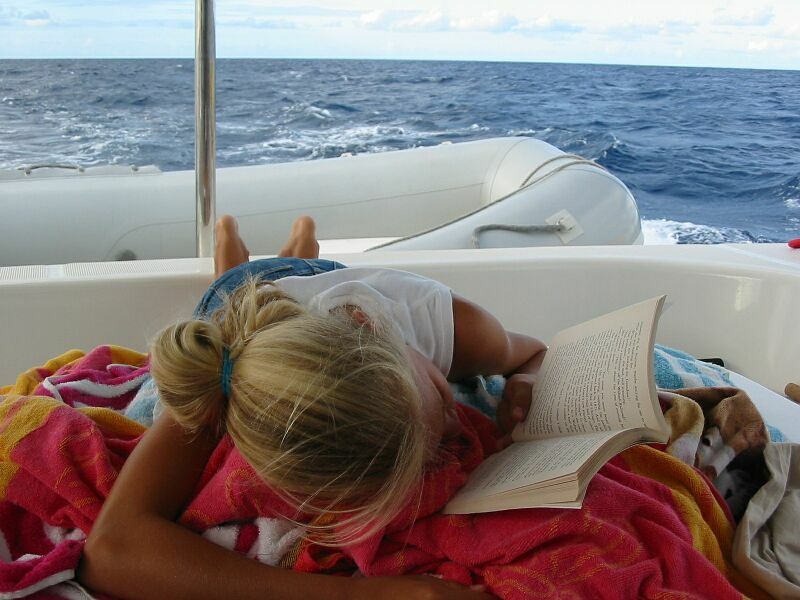 Isha had no offshore sailing experience, and had only been on one previous day sail trip! We were amazed she hadn't jumped ship as soon as she arrived in Saba. But, actually, Isha told us she had expected the trip would be a challenge, and she seemed to be a very flexible person to us. By the way, she knew Alex from MIT where she is also getting her Masters in EE. Isha was only going to spend a few more days with Tomacho, and so they were headed to St. Barts in a day or so for her to fly home. We suggested to Alex he let Isha at least go to a nice beach for a day in St. Barts. The next day, after sleeping in a bit, we got prepared to go ashore. We went over to Tomacho and picked up Alex and Isha and invited them to go on a taxi tour of the island with us. So, we went ashore and found Vincent and had a nice day together. 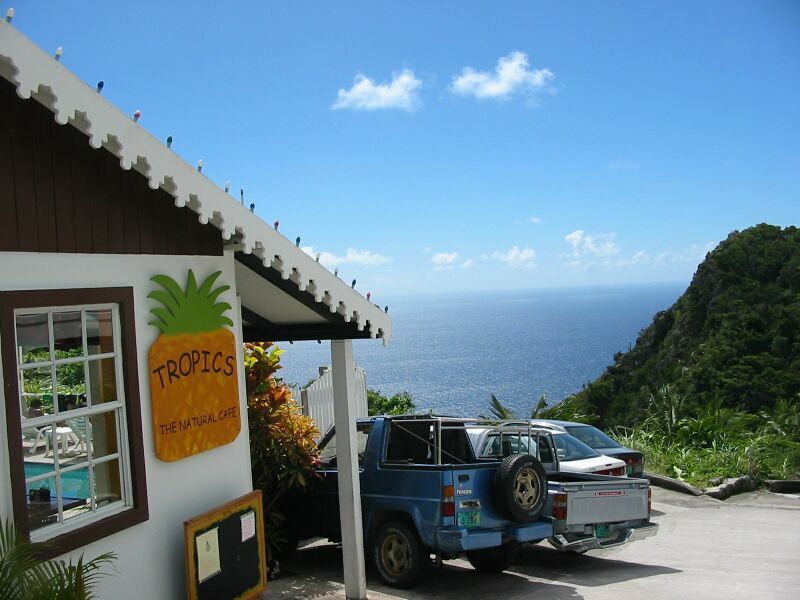 We had lunch at Tropics (see the pictures), saw the Caribbean's shortest runway, saw several beautiful churches, walked part way up the trail to the summit of the main volcanic peak, and generally were impressed with the incredible views. We had made arrangments to be back to our boat by 5:00 PM so we could have dinner later with the Walch's on Hotel California. So, we headed back to Fort Bay by 5:00 and Alex deflated his small dinghy and we took them back to Tomacho. Here's a picture of Tomacho, Alex and Isha with us at Tropics for lunch, and a picture as we went up the trail towards the summit. By the way, the only thing we asked from Alex for rescuing his boat is that he would help another cruiser in need to return the favor. The next morning, on Monday, January 13, we said goodbye to Saba and departed for St. Martin. We had a nice sail over to Simpson bay, pretty much on a single tack again. There were some choppy points, and the winds shifted around a bit, but by and large it was a smooth passage. Here's some shots during the passage which shows some of the silly, casual, and serious sides of a passage. Since we were familiar with the process in St. Martin, we quickly cleared customs and went ashore to run our errands. This included doing the web site update of the 13th, groceries, and some clothes for the girls because they've been growing. Oh, and Frank lost a walkie talkie overboard and had to buy a new one in order to meet up with Karen and the girls. The funny thing was while Frank was taking the bus over to Phillipsburg to buy the walkie talkie, Karen and the girls got on the same bus! 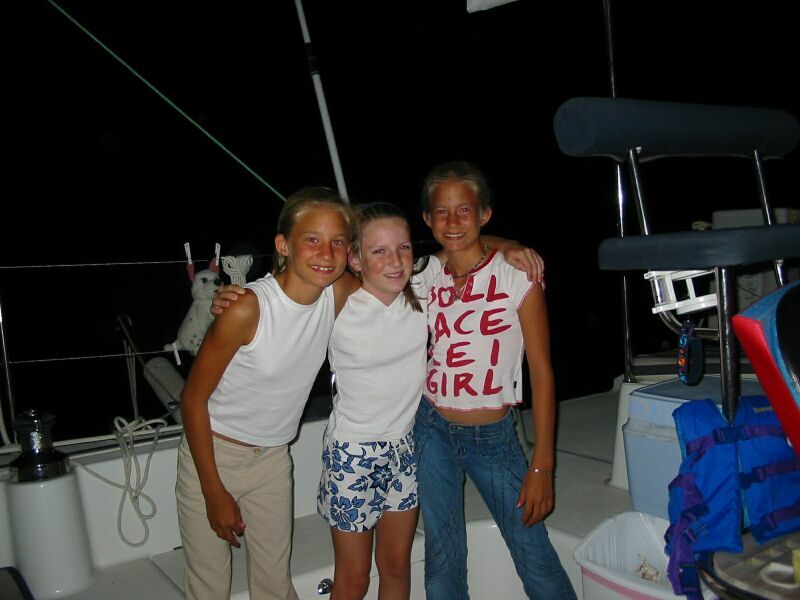 The next day we left for St. Christopher, aka St. Kitts.